Lacy Sunshine is sponsoring our new Anything Goes themed challenge at Crafting From The Heart. The wonderful image I am using is called Love and Peace Hippie Rory and I colored it with ProMarkers. All circles are cut with different Spellbinders dies and the image is attached on the card with 3d-pieces. Flower paper is a digital one from ToutAimee and light blue one is also a digi paper, from Timber Scraps. Flower is cut with a Marianne Design die and I added apple green rhinestones on it for a little bit of sparkle. Lacy Sunshine sponsoroi uutta Mitä vain -teemaista haastettamme Crafting From The Heart -sivustolla. Korttiini valitsin kauniin digileimakuvan nimeltä Love and Peace Hippie Rory, jonka väritin promarkereilla. Ympyrät on leikattu erilaisilla Spellbindersin stansseilla ja kuva on kiinnitetty korttiin 3d-palasilla. Kukkakuosinen paperi on ToutAimeen digipaperi ja ruudullinen yksilö Timber Scrapsin (myöskin digi), Kukan leikkasin Marianne Designen stanssilla ja kimallusta tuomaan lisäsin siihen muutaman omenanvihreän akryylijalokiven. Cute card! Love the paper! The image is so sweet, great job colouring it! Thanks for joining us at Die Cuttin Divas this week! Beautiful card you've make! 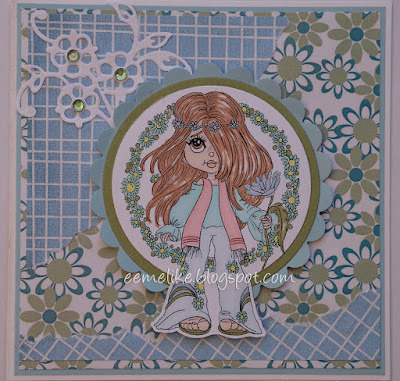 Lovely image and you really nice What you did whit the pattern papers! Nicely done! Thank you for joining our “Anything Goes with Die Cuts” Challenge this week at Die Cuttin’ Divas. danke das du bei den Sketchtanten mitmachst . Ganz bezaubernd! Gefällt mir total gut, wie du den Sketch umgesetzt hast. Vielen Dank für die Teilnahme bei den Sketchtanten. Beautiful card, love the colours and design. Thanks so much for joining us over at Emerald Faeries Challenge Blog, good luck and hope to see you again. That's a pretty flower power Card. Nice colours and a cute Image! Thanks for joining us at Sketchtanten. Lovely card and fabuluse use the Sketch. Thank you for joining us at the Sektchtanten. Such a beautiful and colorful creation, love it!! REally enjoyed this card as I was a "flower Child" many years ago. 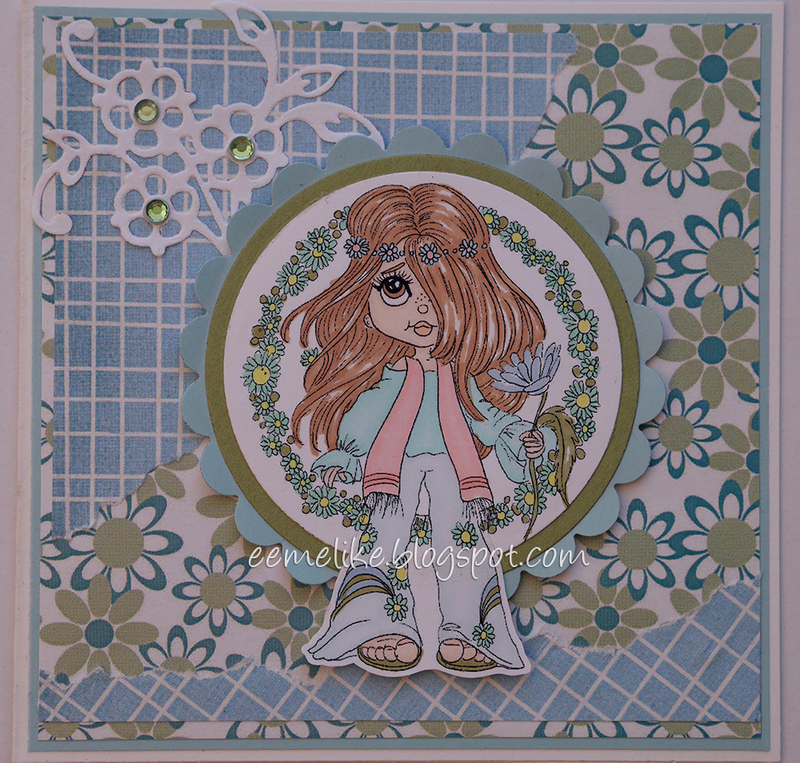 This cute stamp and card captures that "flower child" feel! She looks like summer hippie pixie. Thouching fairy creature!